Before Alwinton, turn right towards Clennell Hall. Before the next bridge park on the grass haugh ( NT925062 ). Head past Clennell Hall and onto the red gravel track through the valley. Cross two small concrete bridges and then a cattle grid. After 200 metres leave the track, immediately after the burn, and climb the obvious path up the end of the Dodd. Continue heading north and on reaching a depression turn north eastwards, aiming for the corrugated building and then towards Puncherton Hill. Continue in the same general direction over the top of the hill, initially with a fence to your left, and then gradually downhill along a faint quad track towards a five bar gate. Once through the gate focus on the north easterly edge of the forest to your left and to Wether Cairn beyond. There are some sheep traces and quad tracks across the open hillside, but none lead directly to the ultimate goal. So choose your own route. Once the brow of the hill is reached, aim for the fence along the edge of the forest and follow this until a second one is reached. 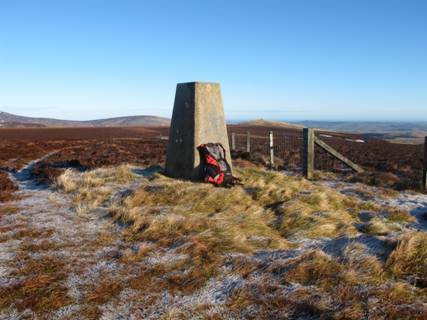 Cross the stile, turn left and head past the shelter cairn to the trig point.